’Tis the season for firing up the oven and reveling in baked delights of all kinds. Here, we share recipes for homemade sourdough — a crusty boule to pair with winter stews, and English muffins for soaking up local honeys and jams on cold winter mornings. These recipes will have you achieving top-notch flavor while keeping things simple. Sourdough bread is my favorite kind, thanks to its chewy crust and soft, tangy interior. There is nothing like a warm chunk of sourdough paired with a hot bowl of soup on a crisp day. 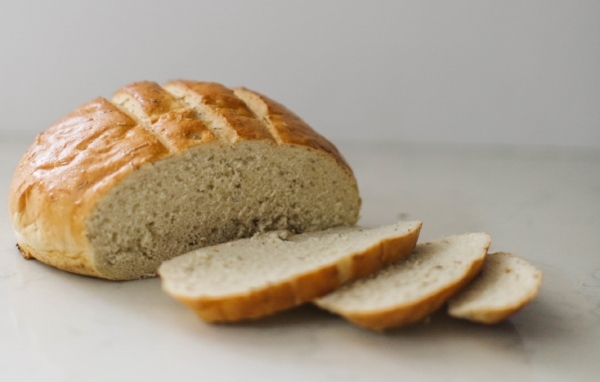 The main differences between sourdough bread and bread leavened with commercial yeasts are the presence of wild yeast and the significance of bacteria in the sourdough starter. It is the starter that gives sourdough bread its characteristic tang and moist crumb. That moist crumb extends the shelf life of sourdough, making it perfect for someone who takes a little longer to finish a loaf. Wild yeasts naturally occur all over the planet, but not each strain exists in all places. For example, sourdough made in western Colorado may not taste quite as tangy as a loaf from San Francisco, thanks to the particular yeasts in the San Franciscan air due to its location next to the Pacific Ocean. Many bakers are intimidated by the starter needed to create a beautiful loaf of sourdough, but it is surprisingly simple to make. Here’s how to give it a try. Mix 1 cup of whole wheat or rye flour and ½ cup of warm water together in a non-reactive container that can handle a fair amount of sourdough growth. A quart-sized canning jar is perfect. (Note: Use distilled water if your water at home is highly chlorinated.) Loosely cover the jar with a piece of cheesecloth or a clean kitchen towel, or just leave the lid askew. Airflow is highly demanded here. Store the jar in a dark, room-temperature space like a cabinet or pantry. Feed the starter. You may have some movement — or not, which is OK. Discard half of your current starter. To the remaining half, mix in 1 cup of all-purpose flour and ½ cup of warm water. Replace the covering and place the jar back in your cabinet or pantry. You should see some more movement, but it is still OK if you don’t. You’ll start twice-a-day feedings, following the Day 2 steps about every 12 hours. If it looks like your starter has died (i.e., there are no bubbles or movement), just keep up with the feeding schedule. Continue discarding, feeding, and storing for about 4-5 days. You should see lots of bubbles and movement, and there should be a strong, tangy smell. This indicates that there should be enough yeast to give your bread a vigorous rise, and sufficient fermentation to achieve a characteristic sourdough flavor. Here in western Colorado’s dry climate, it may take longer than seven days for your starter to be ready. That’s OK, just keep going! Now you’re ready to bake a loaf of bread. If the loaf is successful, your starter is successful. If the loaf is not successful, continue to grow and feed your starter. In a rush? Here’s a quick sourdough recipe to get you baking sourdough bread in 48 hours. 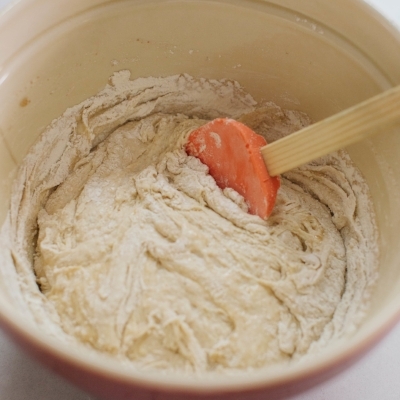 In a ceramic bowl and using a wooden spoon, stir together the flour and yeast. Loosely cover the bowl with Bees Wrap or wax paper (to allow air flow), and place it in a warm place, such as the countertop under the cabinet light, or in the oven with the light on. Allow the starter to ferment for 48 hours, stirring two or three times during those two days. It should start to bubble. After 48 hours, you can use some of the starter in your favorite recipe and store the remainder in a closed glass container in the refrigerator. To replenish, add 1 cup of flour and 1 cup of warm water to at least 1/2 a cup of the starter. To bake more bread, take the starter out of the refrigerator 24 hours before you plan to bake so it can activate again. Starter will last almost indefinitely, as long as you stick to a feeding schedule. For a more open crumb, continue feeding twice daily. For a tighter crumb, back off to once-a-day feedings. Once the sourdough starter is very frothy and bubbly on top, it is OK to store the starter in the refrigerator. 1. Whisk the starter and water together in a large bowl. Add the flour and salt. Combine until a dough forms, then finish mixing by hand to fully incorporate the flour. The dough will feel dense and sticky. Cover it with a damp, clean towel and let rest for 30 minutes. 2. Work the dough into a ball by folding it over in sections, pressing your fingertips into the center. Place the dough in bowl, cover, and let it rise at room temperature until doubled in size (about 8-10 hours, or overnight). 3. Shape the dough into a round loaf on a lightly floured surface by folding it in sections toward the center. Cover the dough and let it rest for 30-60 minutes, until puffy but not yet doubled in size. 4. Score the top of the loaf. Bake on a preheated baking stone or sheet pan at 450° for 40-45 minutes. Cool completely on a wire rack before slicing or packaging in an air-proof container. Makes 1 boule. 1. Mix together sponge ingredients until just combined in a large bowl. Cover and let rest for 8 hours or overnight. 3. 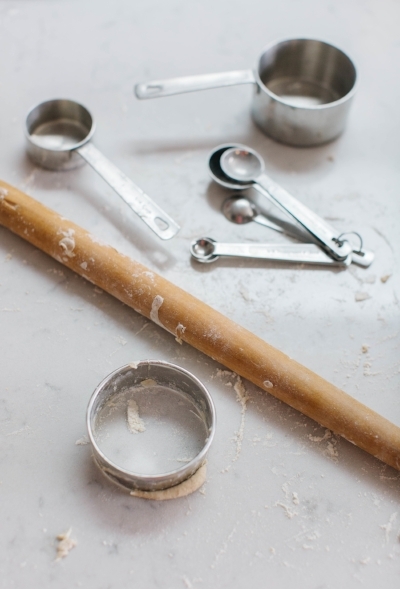 Flour the counter and your hands, then roll or pat dough out to a thickness of ½ inch. 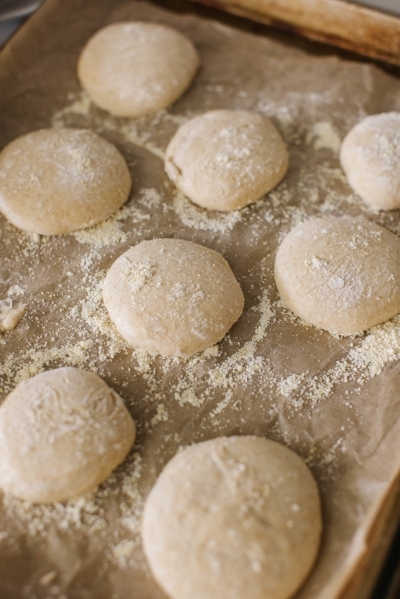 Cut dough into 3-inch circles and place them on semolina-dusted parchment paper. Cover and let proof for 45-60 minutes. 4. Oil and heat the griddle on medium-low. Cook muffins for 7-8 minutes on each side until they are browned and sides are firm. Cool on a wire rack. To get the best nooks and crannies for toasting, split the muffins with a fork, rather than a knife. Makes a dozen muffins. Hack a steam oven: Adding steam at the start of baking results in beautifully rounded loaves with a perfect crumb and glossy, delicious crust. Don’t have a fancy steam oven at home? No problem. Chef Branscum offers this easy alternative: Place a cast-iron pan on the lowest rack in your oven while preheating the oven. After loading the bread into the oven, pour a cup of boiling water in the cast-iron pan and close the oven door. If you forget a few feedings, just get back on track and let the starter sit at room temperature until you see movement again. If there is a layer of liquid on the top of your starter, you can stir it back in. Each batch of sourdough starter is unique, with its own variety of yeasts and bacteria. You may find that you need to feed it more/less frequently, or that it performs/tastes better when kept at room temperature. The starter should also be fed at least 12 hours before you turn it into a loaf of bread. Feeding the starter keeps it more active, creating more leavening action. Have you heard about the Culinary Arts and Baking & Pastry Arts departments at Western Colorado Community College, a division of Colorado Mesa University? The programs offer classes, certificates, and Associates of Applied Science degrees to students seeking job training in cooking, nutrition, and sustainable cuisine. Through a concurrent high school program in the Culinary Arts department, high school juniors and seniors can take college courses and graduate with a certificate in food production – a jump start toward working in the food service industry or pursuing a degree at WCCC or CMU.